There is a family myth amongst tens of thousands of American families: "The name was changed at Ellis Island." The stories claim the immigrant arrived at Ellis Island and was unable to communicate with the officials. A record was then created by someone who assigns the immigrant a descriptive name. 1. Passenger lists were not created at Ellis Island. They were created abroad, beginning close to the immigrant's home, when the immigrant purchased his ticket. In 99% of the cases, the clerk filling out the forms and creating the passenger list in "the old country" knew how to speak, read, and write your ancestor's language. That clerk filled in the proper name. In the case of Eastern European or Oriental languages, those forms even included the correct non-Roman characters. To be sure, spelling variations were common as the immigrants usually were illiterate and often didn't know their own alphabets or how to spell their own names. The clerks wrote what they heard, which may or may not be the same spelling used elsewhere. In fact, there might not be a "correct" spelling. However, what was recorded ALWAYS sounded correct, especially when pronounced in the immigrant's language. It is unlikely that anyone at the local steamship office in "the old country" was unable to communicate with the immigrant or his/her family. Names were most likely recorded with a high degree of accuracy at that time. Those lists of names were later delivered to immigration officials at Ellis Island. 2. The idea that the immigrant was unable to communicate with officials at Ellis Island is ludicrous. In fact, one third of all immigrant inspectors at Ellis Island in the early twentieth century were themselves foreign-born, and all immigrant inspectors spoke at least three languages. In addition, Ellis Island and other ports of entry also hired an army of interpreters, most of them as part-time employees. These interpreters always (repeat: ALWAYS) could speak, read, and write the languages of other immigrants. If a new immigrant arrived and no interpreter was available for his or her particular language, that immigrant was detained at Ellis Island until a qualified interpreter was located and brought in for the interview. 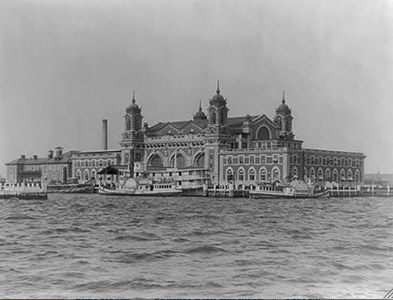 Most immigrants were processed through Ellis Island within a day or two but there were cases where immigrants were detained for several days until an interpreter became available and proper documentation could be completed. Nobody passed through the process without being interviewed by someone in a suitable language. 3. The passenger lists were always prepared in "the old country" by steamship company officials. If any immigrant arrived at Ellis Island and provided a different name to officials, he or she was always denied entry. If a brief investigation could not clear up the mystery, the immigrant was shipped back to the old country on the steamship's return trip. NOTE: Many immigrants were refused entry for a variety of reasons and were returned. Estimates seem to vary from 12% to 18% of all would-be immigrants were denied entry into the United States and instead were sent back to their originating countries. The fates of most of these returnees has not been well documented. 4. Later immigrants had to verify their correct names every year. Starting in July of 1940, the Alien Registration Act required every alien resident in the United States to register at their local Post Office in January. As part of the registration process, the immigrant had to provide ALL names by which he or she had ever been known, including his or her full name as used in "the old country" as well as the name used currently. Alien Registration requirements applied to all aliens over the age of fourteen, regardless of nationality and regardless of immigration status. Despite these facts, the Ellis Island name-change story (or Castle Garden, or earlier versions of the same story) is as American as apple pie. However, there is little to no truth to these stories. When Did the Names Change? After processing through Ellis Island and settling within the United States, many immigrants DID change their names. In numerous cases, the names were changed for them by public officials, schoolteachers, shopkeepers, and neighbors. Anyone from Eastern Europe, with a name LONG on consonants and short on vowels, learned that his name often got in the way of a job interview or became the subject of ridicule at his child's school. Any change that might smooth their way to the American dream was seen as a step in the right direction. In many cases, these later name changes were made without court papers or any other official recognition. In any case, the records at Ellis Island and other ports of entry always contained the original names, although with frequent spelling variations. Clearly you do not know what you are speaking of. families did it all they time. as in those that came here, told their children that they did. as in my great great grandfather told me he did. and I use to work at a nursing home. they told stories as well of changeing their names. please study more before you confuse someone that does not know better.